Arrive Bangkok Suvarnabhumi International Airport & Proceed towards Immigration followed by Bag collection & Customs. Meet our Representative at Arrival. Bangkok Airport to Pattaya by Road (02 Hours Drive). Proceed to Lunch. In the evening Visit World Famous "Alcazar Show" performed by Beautiful Artist of Thailand with complimentary drink during show (Included in Tour Cost). Overnight at hotel in Pattaya. After English breakfast proceed for full day tour of Safari World with Marine Park. Enjoy Orang Utan Show - Sea Lion Show - Hollywood Cow Boy Stunt Show - Mini World - Dolphin Show & Open Zoo (All Included in Tour Cost). Enjoy Indian Lunch prepared by Safari World Kitchen. Drop at Bangkok's Famous Shopping Hub "M.B.K Mall". Enjoy shopping at your own & come back to hotel at your time (before dinner time) by local taxi at your own cost (As Coach Parking here not allowed). Overnight at hotel. After breakfast full day free for shopping / rest. Enjoy Lunch & Dinner prepared by Heena's Rajasthani Maharaj. Overnight at hotel. After early breakfast proceed to Bangkok airport to board your flight to Kuala Lumpur. Arrive Kuala Lumpur airport and proceed to Batu Caves. Enjoy South Indian Lunch Mini Madras. After visit to Batu Caves proceed to Kuala Lumpur & check in at Hotel. 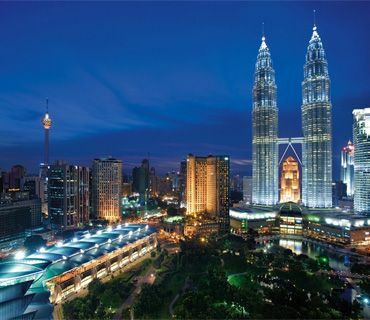 Later in the evening, proceed for City Tour of Kuala Lumpur including many key attractions. After the tour ends head to enjoy dinner. Proceed for a photo stop of Twin Tower by night with treat of Ice Cream. Overnight at hotel. After English breakfast, you will head to Genting Highland. Experience Asia's Longest & World's Fastest Cable Car "Sky Way" to reach Genting Highland. Orientation tour of Asia's Biggest Casino "Sky Avenue (Casino)". Enjoy Lunch prepared by Heena's Rajasthani Maharaj at Most Prestigious Dinning Hall of Genting Highland "Spice Garden". Visit History of Genting "Galleria". Return to Kuala Lumpur. Enjoy Dinner. Overnight at hotel. After early breakfast, proceed to Singapore by road (5 Hours). Experience smooth drive on 2nd Link National Highway with Hindi Movies on board. Arrive Singapore & proceed to Heena’s Kitchen for Delicious Pure Gujarati Lunch 100% prepared by Heena's Rajasthani Maharaj. Check In Hotel at Singapore's most happening area. Free time for rest and small nap. In the evening visit World's only "Night Safari" which includes Tram Ride, Animal Show & Fire Show. Proceed for Dinner prepared by our Rajasthani Maharaj. Overnight at hotel. After English breakfast, proceed for Half day city tour of Singapore including many key attractions. After that enjoy Lunch & proceed towards Sentosa Island to visit "Wings of Time" Musical Fountain show with Laser Light and Fire Works. Proceed for dinner prepared by our Rajasthani Maharaj. Overnight at the hotel. After English breakfast, proceed for full day tour of "Universal Studio"(all rides included). Enjoy Packed Lunch from Heena. Overnight at the hotel. After early English breakfast proceed to Changi Airport to board your flight for Mumbai. Arrive Mumbai with memorable experience of the tour conducted by Heena Tours & Travels. Services of a Heena’s In house Gujarati tour Manager. Any increase in accommodation prior to departures. Excess baggage charge (Minimum 20 Kg Baggage allowance permitted by Airline and Coach, anything addition is chargeable and has to be paid directly). Items of personal nature like porterage, laundry, telephone charges, shopping wines & alcoholic beverages, mineral water, food and drinks not forming part of the group menu, etc.